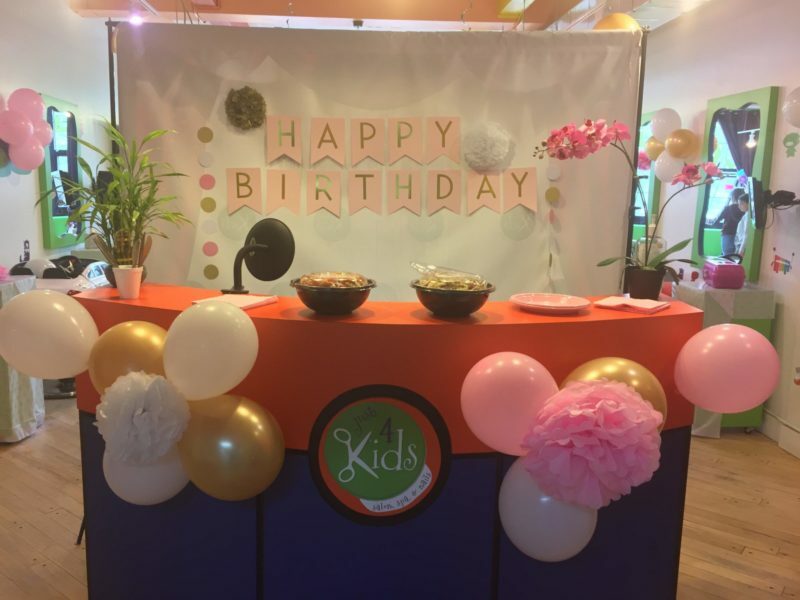 Just 4 Kids Salon - Pamper Me Kids Spa Birthday Party - Book Today! Want to further customize your Pamper Me Kids Spa Birthday Party package with lots of fabulous add-ons? Sure! No problem! Finally, check out our a la carte upgrades page now! It’s said that a kids haircut will make your child’s day, but a spa birthday party will absolutely make their year! 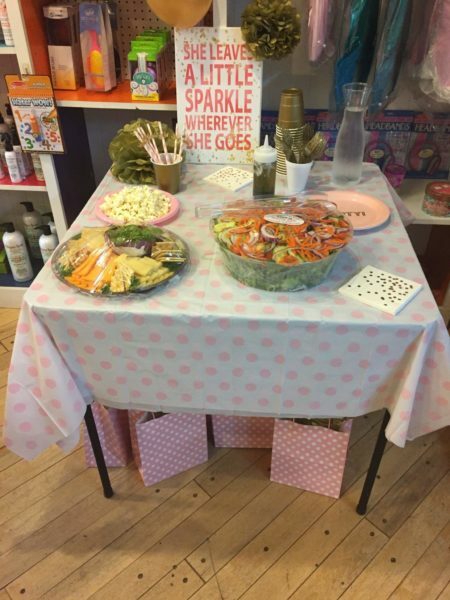 So what’s included in a Pamper Me Kids Spa Birthday party? Well, it starts with beautiful decorations, great music, exciting lights, fun food and drink and awesome services! Furhtermore, that’s just the way our Pamper Me Kids Spa Birthday Party goes down… Upon arrival, the birthday girl and her friends will greeted warmly and treated to plush soft robes to begin the decompression and relaxation process! Finally, we offer a wide variety of fun kids music via our state of the art sound system, and fun and colorful lighting to set the mood. Girls will follow an assembly line of pampering spa treatments, including therapeutic manicures with bright and colors of nail polish! Next, cool and refreshing chocolate yogurt facials capped off with glamorous and an enhancing makeup application! 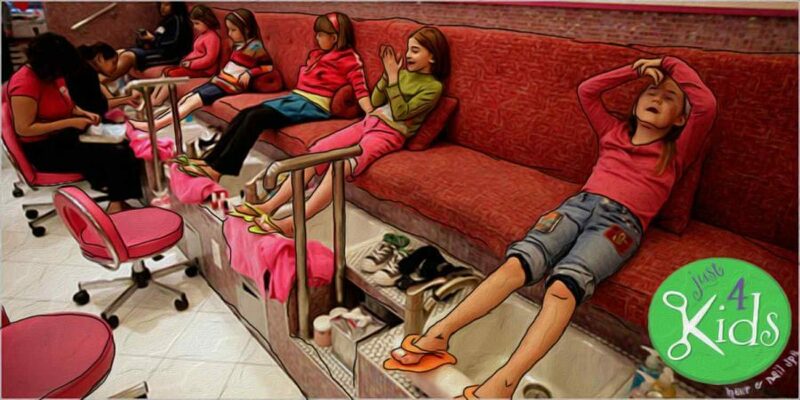 Finally, all children and party goers leave looking sharp and beautiful! As the services are wrapping up, two hot, fresh and delicious pizza pies will arrived, served double-cut for child friendly appetites! Cool and delicious organic fruit juice and water are also served to wash it all down! None – Base level parties include plain small balloons & table cloth in your favorite color; Two large pizza pies, water, juice & plain white paper plates, cups & plastic silverware. Each party includes eight (8) girls. Finally – Contact your Professional Party Coordinator Now! Printable Party Invitations are also available for free here! 1.) Skin Care – Receiving periodic facials throughout life will renew your skin, and give yourself a healthy and youthful glow. Also, In addition to deep cleansing and exfoliating your skin, the massaging of the face can be incredibly relaxing. Finally, regular facial treatments have been proven to treat acne early in life, and diminish signs of aging later on. 2.) Nail Health – Regular manicures offer some terrific health benefits outside of just getting pampered. They showcase your hands and feet with a youthful appearance by removing dead skin and hangnails. Further, our trained nail technicians apply special oils and creams to moisturize and nourish skin and cuticles. Consequently, this sets a valuable foundation for maintaining youthful looking skin at an early age. 3.) Detoxify – Body treatments and scrubs used on the face and nails deep-clean and moisturize your skin. Coupled with massage, these treatments help to rid the body of impurities. Also, establishing good healthy habits early in life provide a strong foundation to looking youthful later in life. Finally, detoxifying and purifying your body regularly has been proven to boost your immune system, leading to a longer and healthier life! In conclusion, this stuff is good for you! 4.) Have a Self-Renaissance – Taking a “spa day” has been proven to release endorphins, which help to give a renewed optimism and brighter outlook on life! Re-discovering your inner beauty will not only glamorize your exterior, but energize your inner-self, offering a profound sense of renewal. Also, the spa is the ideal setting for self-reflection, rediscovery, inner healing and health. Further, when little girls learn these valuable lessons early in life, they are more likely to “stick with them” when they grow into adolescents and women. Finally, relieving stress, soothing your body and refreshing your mind is the backbone of a healthy and happy life. 5.) Glamorize – Although the most “superficial” of listed benefits, it is still important for every girl to feel beautiful and confident. Also, spa services can heal your inner -self, and permeate “through” the body, exuding an inner glow and confidence that translates into beauty. Finally, when you add in the aesthetic benefits of makeup and nail art, you most certainly help yourself feel beautiful and confident! Next? So what are you waiting for? 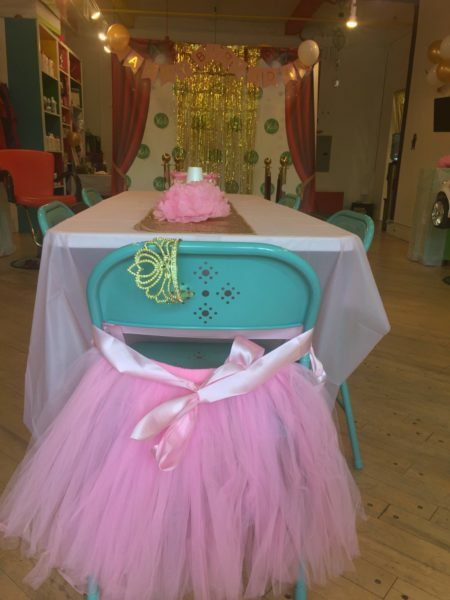 Book a Pamper Me Kids Birthday Party for your little pricess today by calling our salon at (201) 653-5887! Finally, we will require a credit card deposit / hold to reserve your requested time and date for the party! Further, we have other options as well! Care to keep browsing our other terrific theme parties? Sure! Next, if you would like to keep browsing our list of fabulous birthday party packages, click back on our Birthday Party Menu now! Finally, thanks for checking out our page!